“Fifty” was the theme when the Fountain Poets met at the Sherston Inn last Monday with Karin in the chair. Some chose to write about the 1950s – Richard’s memories of growing up in Oxfordshire, Jinny’s scenes from a 50s childhood, Mark’s fond reminiscences of Marilyn Monroe’s 50s films. Ewan wrote about rowing as a schoolboy on the River Severn. Morag read “2015-fifty”. Karin’s poems are densely-packed with layers of meaning and metaphor – quite a challenge to take in at a single hearing! We look forward to seeing them in print. The two she read touched on the experience of turning fifty recently. From Wendy we heard a delicious story-poem about the love of a 50-year-old Romeo and his Juliet. Ama’s poem was a response to seeing St Kilda from a distance of fifity miles. The refugee crisis prompted other poems, including Rachael’s “Silent faces keep appearing“, Ewan’s “Places Isaac and Rebecca Knew”, Morag’s “Mull” and Ama’s “The Risk-takers“. Jo’s poem “Machine to destroy Landays” (forthcoming in Obsessed with Pipework) refers to a subversive form of Afghan folk-poetry practiced mainly by women. To learn more, see this fascinating and heartbreaking essay by Eliza Griswold. Jo’s second poem was a product of her practice of writing a weekly poem with words taken from the current issue of “New Scientist”. Wendy’s second poem was “I like to walk the Monarch Way”. Wendy will be reading at “Twenty Poets Perform” in the cafe area of Bristol Central Library on the afternoon of Saturday 26th September, an annual (free) event ably organised by Mark as part of the Bristol Poetry Festival. From Caroline we had memories of a holiday in Cornwall, and a short sharp reaction to muzak. From Pamela, the heartfelt “After they’ve gone”, and by way of contrast, a wry birthday-card rhyme. Jinny is to be congratulated on having not one but two poems in this year’s Bridport Prize short-list. Her poem in the second half, inspired by a very strange news-item, caused a sharp intake of breath, followed by applause. It was an evening of rich fare. 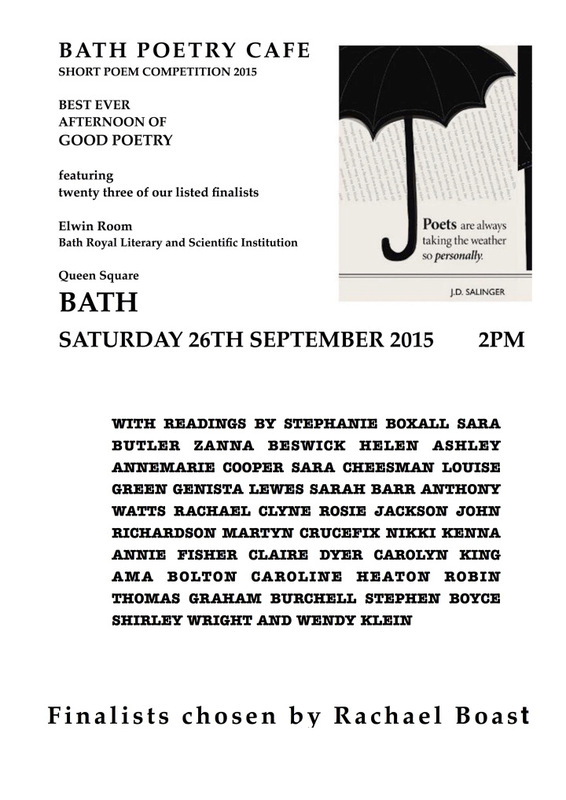 Another event on the afternoon of 26th September will be the prizegiving and reading of the short-list of the Bath Poetry Cafe Competition. Fountain poets present will be Ama, Rachael, Sara and Zanna. For more information go to Sue Boyle’s blog. On Tuesday 29th September, Wells Fountain Poets’ collaborative project Waterwoven will be performed in public for the third time, with Andy reading the part previously read by Ewan. This will also be at Bristol Central Library. Rachael Clyne will also have a solo set at this event, which starts at 7.30pm. The Bristol Poetry Festival runs from 21st Sept to 8th Oct.
Swindon Poetry Festival runs from October 1st to 5th. On the evening of 3rd October Ama will be reading her poem “Winter Boat” at the Battered Moons Competition prizegiving and pamphlet-launch. Sharing a platform with Pascale Petit Cristina Newton and Rosie Jackson! What a privilege! There are some fabulous events on at the festival – have a look at the programme. On Sunday 11th October at 3.30 in the Bishop’s Palace (a free event) the winner of the Wells Festival of Literature Poetry Competition will be announced, with a reading of the short-listed poems. For the full programme see the Festival website. The short-list can be seen here. I’d like to welcome and thank all the followers of this blog, many of whom I’ve not yet met, and especially David of Write Out Loud, whom three of us from Wells had the pleasure of meeting at David Caddy‘s excellent workshop in Dorset on Saturday. Finally … our next meeting will be on Monday 5th October at the Sherston Inn starting promptly at 8pm. Ama will be in the chair and the topic (optional!) will be “Light”, the theme of National Poetry Day which celebrates its 21st birthday on October 8th. My title this month is taken from something Rachael said on Monday … I made a note of it but I don’t remember now if it was part of a poem. 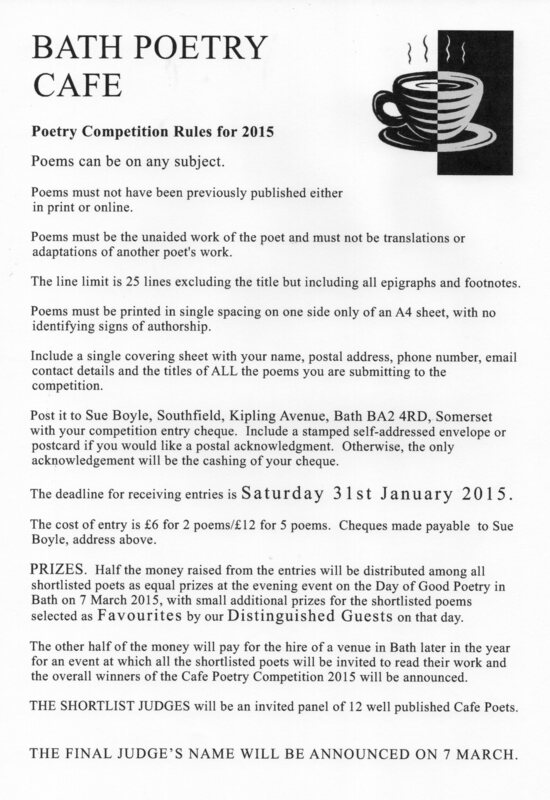 This entry was posted in poetry and tagged Ama Bolton, Andrew Henon, Bath Poetry Cafe, Battered Moons, Bridport Prize, Bristol Poetry Festival, Caroline Toll, Cristina Newton, David Caddy, Ewan MacPherson, Jinny Fisher, Jo Waterworth, Karin Baynes, Landays, Mark Sayers, Morag Kiziewicz, National Poetry Day, Obsessed with Pipework, Pamela Coate, Pascale Petit, Rachael Clyne, Richard Field, Rosie Jackson, Sara Butler, Sue Boyle, Swindon Poetry Festival, Wells Litfest, Wendy Nicholson, Write out Loud, Zanna Beswick on September 14, 2015 by barleybooks. During the week beginning Monday 10th June Bath Cafe Poets will be hosting and taking part in a series of workshops, discussions and readings in Bath Central Library. 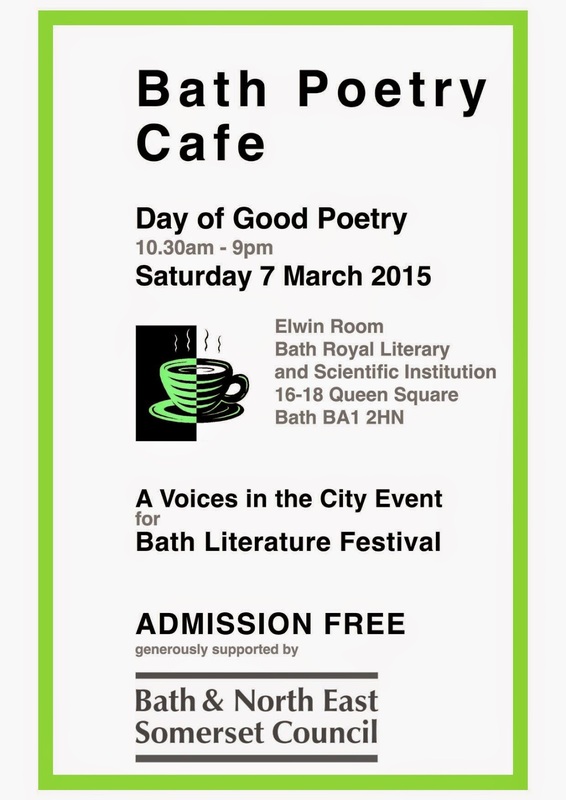 This exciting programme of events has been organised by Sue Boyle, a passionate promoter and enabler on the Bath poetry scene. Full details of the whole week’s events can be seen here on the wonderful Poetry Space website, which is well worth looking at. In addition to Sue and other well-known names (Patricia Oxley, R.V.Bailey, Alwyn Marriage, Wendy French, Anthony Fairweather, William Oxley) many of the Fountain poets will be taking part in these events. There will of course be readings from the new anthology The Listening Walk, which is now available from Amazon.co.uk and worldwide from Amazon.com. And finally, don’t forget that the Fountain Poets will next be meeting on the evening of June 3rd, at the Fountain Inn, 7.45 for 8pm. We hope to see you there! 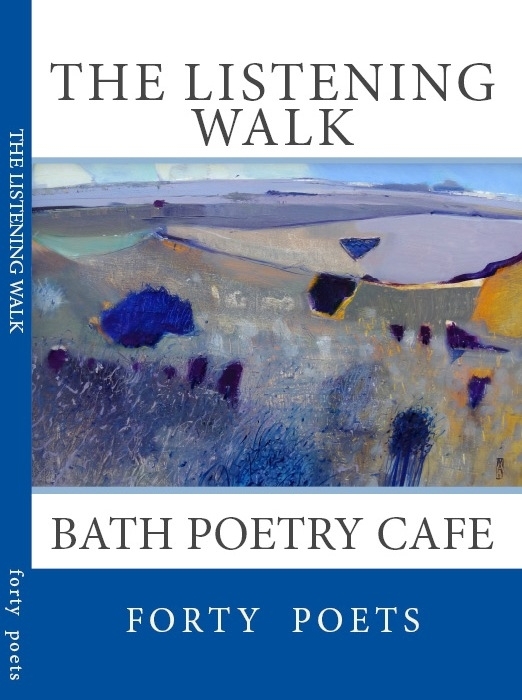 This entry was posted in Uncategorized and tagged Bath Cafe Poets, Bath Poetry Cafe, Poetry Space, Sue Boyle, The Listening Walk, Wells Fountain Poets on May 25, 2013 by barleybooks.